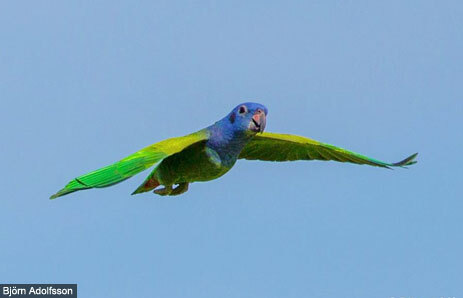 The Blue-headed Parrot is a small parrot, measuring about 10 inches tall. It eats and disperses fruits and seeds from rainforest trees. Their strong beaks allow them to crack very hard nuts and get the good parts from inside. Parrots are very social and stay together in small flocks. As they fly around, their noisy calls are one of the distinctive sounds of the tropical rainforests. Most parrots nest in hollow trees. Depending on the species, they lay from 1-6 eggs and both parents raise the young, sometimes with help by the young they raised the year before. Together, the Parents and the 1-2 year old young are called a "family group." Parrots belong to order Psittaciformes and the family Psittacidae. Parrots are roughly divided into three groups: Parakeets, Parrots, and Macaws. Parakeets are smaller, often with pointed wings and tails. Parrots range from small (8" or 20 cm) to quite large (18" or 45 cm). Macaws, the most spectacular group, can grow up to 36 inches (90 cm) in length because of their long tails. Blue-Headed Parrots, not surprisingly, are recognized by their bright blue heads, which stand out from their almost uniformly green bodies. They also have some pink throat feathers. These birds do not have their characteristic blue heads until they gain their adult plumage at about one year of age. They grow to be about 28 cm (11 inches) in length and weigh between 230 and 250 grams (a little over a half-pound). Their range covers almost all of the tropical areas of South and Central America, except for the Andes. Blue-Headed Parrots make their nests in hollow trees and generally forage in the lower canopy. They are very social birds and are usually seen in small flocks. Loud vocalizations between members of the same flock are common rainforest sounds. These birds are instrumental in the dispersal of rainforest seeds, which they commonly feed on in addition to nuts and fruit fibers. They have larger beaks than other parrot species, and their powerful beaks allow them to crack hard nut shells. These birds are known for the loud hissing sound that they sometimes make when they are frightened. Females lay between one to six eggs, which hatch in about 70 days. Both parents participate in raising the young, as do older offspring. These young mature within one to two years. Blue-headed parrots usually live about 25 years, but can live to be as old as 40! Square tail and intense red color in rump. Size 24.5 to 27 cm. Habitat: Forest and semi-open country, including cultivated areas. They fly like if they were going to touch wingtips under body vocalizing frequently. Easy to see, they perch in open areas. They fly alone or in separated pairs or in groups. This species tolerate more disturbed forests than other psitacids.